With the fallout over Rep. Ilhan Omar’s controversial comments paralyzing House Democrats, Speaker Nancy Pelosi found herself on the floor Wednesday afternoon asking some of her closest allies what exactly she should do. For 20 minutes, Pelosi huddled with senior members of the Congressional Black Caucus — House Majority Whip Jim Clyburn of South Carolina and Reps. Sheila Jackson Lee of Texas, and Karen Bass and Barbara Lee of California — to try to determine what kind of resolution the CBC would back that rejected Omar’s remarks about Israel without unfairly singling her out. It’s a balance that Pelosi and her deputies initially failed to reach when a draft resolution began circulating Monday night. And it’s a surprising scenario for the veteran Democratic leader, who has long prided herself on an intrinsic understanding of her caucus but who now finds herself struggling to clean up the latest political mess created by a high-profile member of the freshman class. Still, the episode clearly brings to an end a string of major wins for Pelosi, who seemed almost politically untouchable after she dispatched a pack of rebels to regain the speakership and then held her caucus together for weeks as she defeated Donald Trump and his border wall demands during the longest shutdown in history. Now the California Democrat is staring down a new crisis — how to police one of her own after a series of comments that some Democrats say are anti-Semitic — and there’s no easy solution. Pelosi called an emergency meeting Wednesday night with senior lawmakers on both sides of the debate to try to resolve their differences, though the meeting ended without a final decision on the resolution. Pelosi and her leadership team have struggled to contain the furor from all corners of the caucus and have seemingly stumbled in recent days over how to respond. At first, Democrats planned to take quick action and pass a resolution on the matter on Wednesday. Amid stiff resistance from the left, they reversed course. Now it‘s unclear when the House will hold a vote, as the party’s factions continue to maneuver against each other. 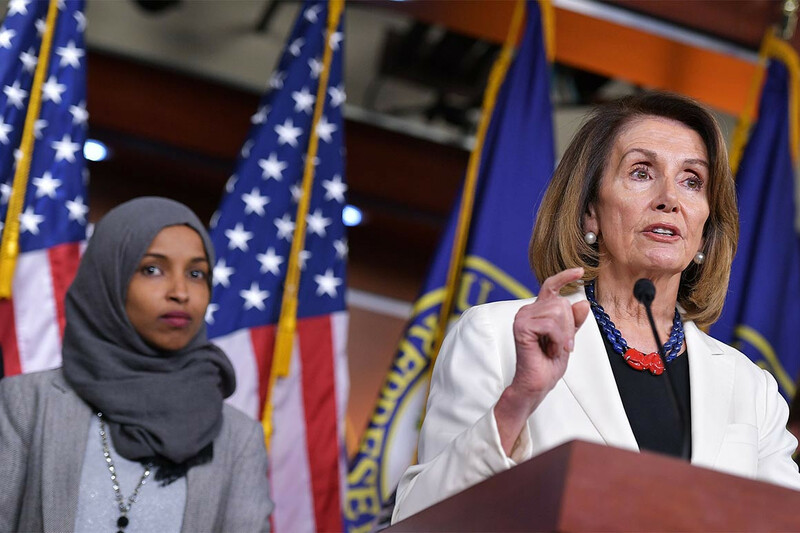 On one side of the argument is a bloc of senior Jewish lawmakers, some of them leaders of powerful House committees, who have demanded Omar apologize for her remarks and be subject to some form of public punishment. Some of those lawmakers wanted the resolution to mention Omar by name and were angered when Democratic leaders decided that would go too far. On the other side is an equally powerful group of black and progressive Democrats who have rallied to Omar’s defense, arguing that she is being unfairly singled out and shouldn’t be punished at all. Some of those members, including in the Congressional Black Caucus, don’t want to see any a resolution on the floor. In the middle is Pelosi.